Eight generations have passed since Nicolas CHIQUET planted his first vine in 1746. In 1919, brothers Fernand and Gaston CHIQUET – winemakers born and bred – came together to create their house, CHIQUET Brothers. They were pioneers in Champagne, among the very first winemakers to take the initiative, bold at the time, to keep their grapes, turn them into Champagne and sell their own product. In 1923, they were awarded their first medal in PARIS, then their gold medal in EPERNAY. In 1935, Gaston CHIQUET separated from his brother to create his own brand. At the beginning of the 1950s, Gaston CHIQUET and his son Claude extended the family domain into the areas of Aÿ and Hautvillers, bringing new blending possibilities. In turn, Claude CHIQUET and his sons, Antoine and Nicolas, ensure continuity by complying with the family rule: “Our primary goal is to maintain the quality standards of our heritage.” While the techniques have been improved, the tradition remains the same. 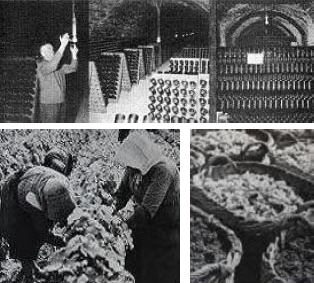 Today, for over 80 years, the brand Champagne Gaston Chiquet is still lead by the family. The two brothers and the next generation, Marion Chiquet (Antoine’s daughter) work 23 hectares of vineyards situated primarily in the precious perimeter of Dizy, Aÿ, Mareuil-sur-Aÿ and Hautvillers. The three grape varieties used in Champagne are cultivated in the following proportions: Chardonnay 50%, Pinot Meunier 30%, Pinot noir 20%.